Blackbirds are blackbirds. Meadowlarks are meadowlarks. In the new world all meadowlarks and blackbirds, along with grackles, cowbirds, orioles, oropendulas, and some others, are members of the family Icteridae, the New World Blackbirds. 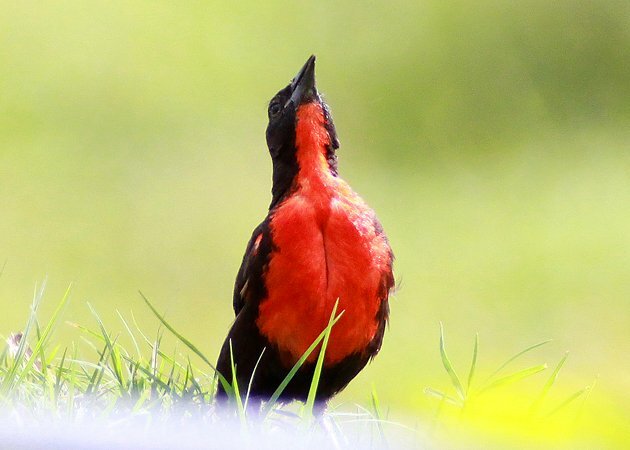 And while the birds that we in the western hemisphere refer to as blackbirds in their common names are from several different genera it wouldn’t be unreasonable to think that if a bird is in the same genus as the North American meadowlarks that it would also be called a meadowlark. If only naming birds were so simple! Sturnella militaris is a meadowlark, from its genus to its chunky appearance. There was a time when both it and the White-browed Blackbird were in their own genus, Leistes, which probably explains why they were given the common name of “blackbird,” though it doesn’t explain why, when they were moved into Sturnella, they didn’t also get a common name change. 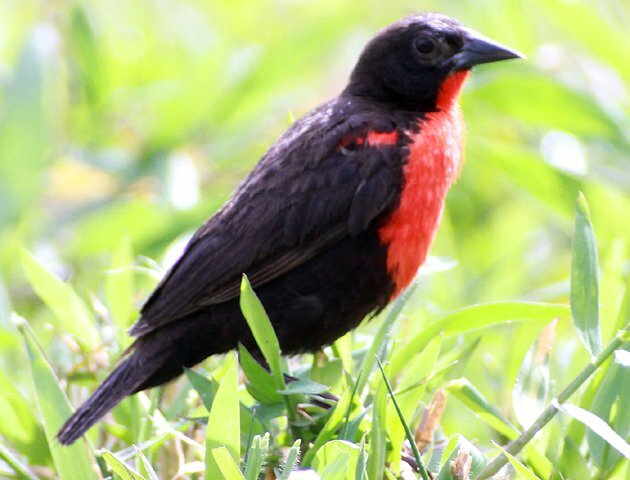 However the Red-breasted Blackbird ended up with its appellation doesn’t matter as much as how great a bird it is, well worth a trip to Trinidad and Tobago to see. It was on the island of Trinidad, at the Aripo Agricultural Research Station, where all of these photographs were taken. 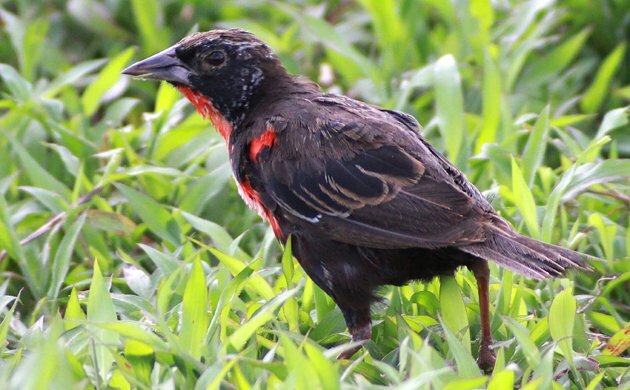 Trinidad is the northern limit of the range of the Red-breasted Blackbird, though it is unclear if the occasional birds that show up in Tobago are wanderers from Trinidad or northern South America or are breeding there. 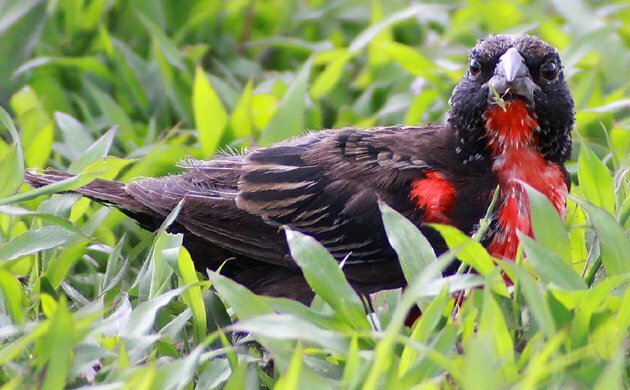 You can also find Red-breasted Blackbirds in Costa Rica and Panama and south to Peru and Brazil. They are considered a Species of Least Concern by BirdLife International because of their large range and stable population. 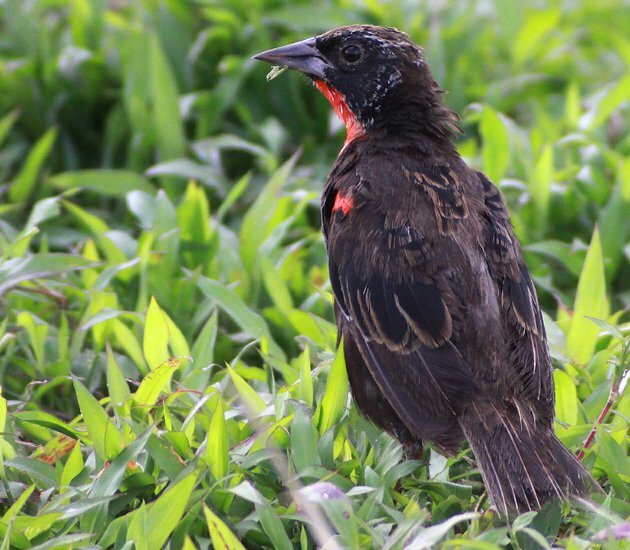 Considering that they only recently colonized Costa Rica and have since been spotted in Nicaragua, it seems that there will be Red-breasted Blackbirds for a long time to come, good news for fans of brilliant birds! 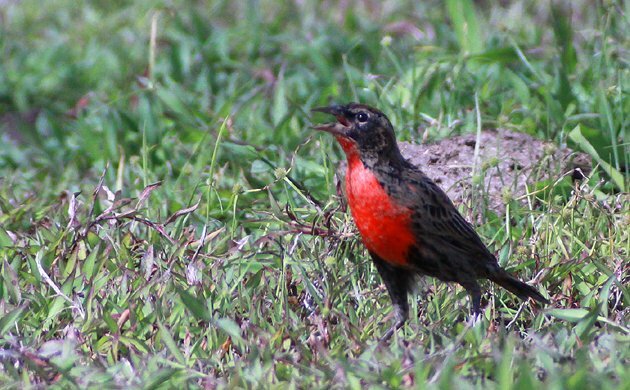 In Trinidad and Tobago, the Aripo Agricultural Research Station is easily the best place to see Red-breasted Blackbirds (to say nothing of South American Snipe, Fork-tailed Flycatchers, and a host of other cool birds). You do need permission to enter for birding purposes, and I would recommend having a guide, as I imagine that you are much more likely to get permission if you show up at the gate with a local. You access the property from the Eastern Main Road, six kilometers east of Arima. If you are in Trinidad and are a birder you should definitely make a stop. If you liked this post and want to see more great images of birds check out 10,000 Clicks, our huge (and growing) collection of galleries! I think you shouldn’t be allowed to count a species for your year list if it is a blacxkbird that’s really a meadowlark regardless of how great a bird it is – and it is. Nice shots of those stunning meadowlarks! 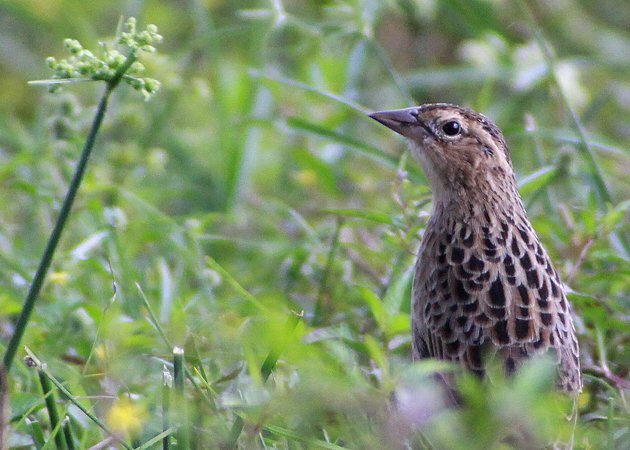 I think I am going to start calling them rice field larks because in Costa Rica, we only find them in that ag. habitat.